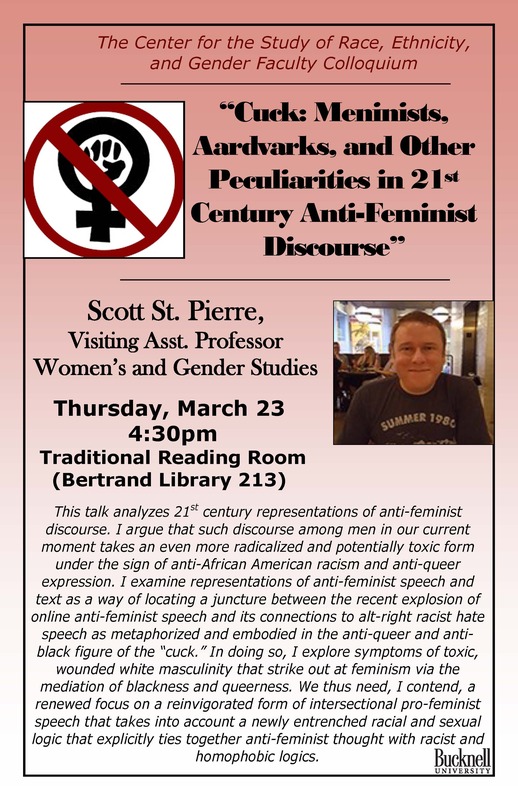 This talk analyzes 21st century representations of anti-feminist discourse. I argue that such discourse among men in our current moment takes an even more radicalized and potentially toxic form under the sign of anti-African American racism and anti-queer expression. I examine representations of anti-feminist speech and text as a way of locating a juncture between the recent explosion of online anti-feminist speech and its connections to alt-right racist hate speech as metaphorized and embodied in the anti-queer and anti-black figure of the “cuck.” In doing so, I explore symptoms of toxic, wounded white masculinity that strike out at feminism via the mediation of blackness and queerness. 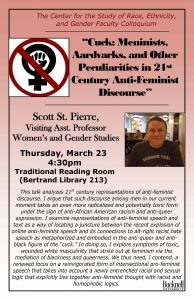 We thus need, I contend, a renewed focus on a reinvigorated form of intersectional pro-feminist speech that takes into account a newly entrenched racial and sexual logic that explicitly ties together anti-feminist thought with racist and homophobic logics.